An air raid siren will play automatically on this page. From 1944, two new types of weapons were used, which had a rocket type of propulsion to launch a war head. They were known as flying bombs. The V1 ( Doodlebug) - They had no pilot and made a droning noise. As soon as the droning noise stopped people had 15 seconds to escape from the powerful blast that followed. Many V1's fell short into the sea, others fell in the countryside. Almost 9,250 V1's were fired against London, but less than 2,500 reached their target. About 2,000 were destroyed by anti-aircraft gunfire; 2,000 by fighter planes, and almost 300 by barrage balloons. The first doodlebug exploded in Swanscombe in Kent. The V2 - The V2's arrived without any warning sound. They also flew very fast and high up in the air; much too high to be shot down by the anti-aircraft guns of fighter aircraft. 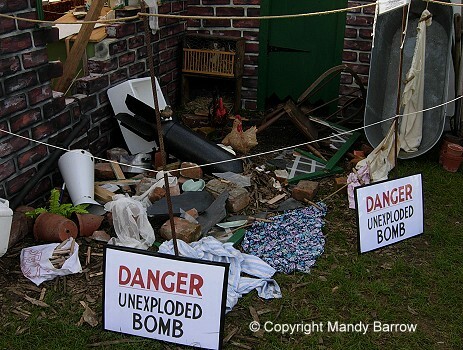 How did people protect themselves from the bombs during an air raid? Air Raid Shelters were built. To help prevent the Germans from seeing where the towns were, a blackout was rigorously enforced after darkness. This meant that all sources of light had to be blacked out. What was life like during the Blitz? Life was very hard during the Blitz and frightening too. 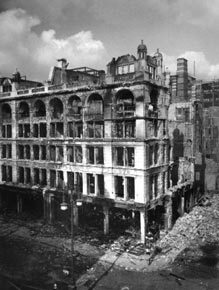 London, in particular was very bad as it was bombed nearly every night. People in London spent most nights sleeping in Air Raid Shelters. No one within any distance of a likely target such as a big city could sleep entirely easy in their beds. Sometimes German bombers made mistakes and dropped their bombs in entirely the wrong areas. At other times, returning from a raid, they would dump the remainder of their explosives at random in order to fly home in greater safety. 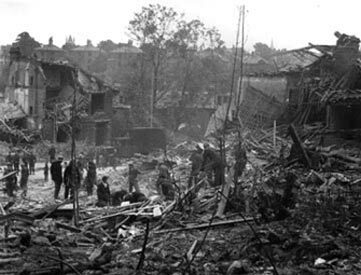 Many bombs fell on the areas around the cities and in the Kent countryside, known as 'bomb alley' because it lay on the flight path to London. It was difficult to move around at night time due to the Blackout and the problems it causes. Families were separated with children being in evacuated. Food and clothing were rationed and hard to get hold of because of shops being bombed. How did the government try to protect cities from being bombed? 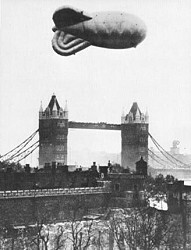 Barrage balloons were put up to force the german planes to fly higher – so their bombing would be less accurate. The Barrage balloons were tethered by steel cables strong enough to destroy any aircraft which flew into them. 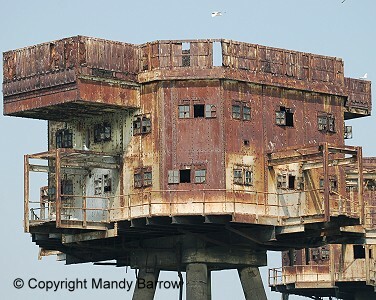 To stop enemy bombers finding their way up the Thames estuary, in 1943 the army built Redsands Fort, a group of anti-aircraft platforms off the Kent coast. When did the blitz end? 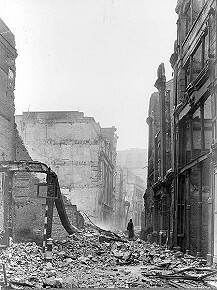 The Blitz ended in mid-May 1941, when much of the German air force was sent east to prepare for the invasion of Russia. The next big air attacks came from the terrifying V-1 and V-2 attacks. These were flying bombs (doodlebugs) catapulted into the air from camouflaged launched sites in northern, Occupied Europe. 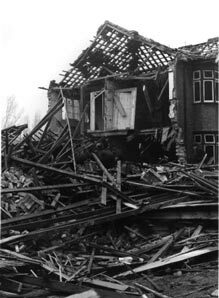 Have a look around a home and see if you can spot ways people protected themselves during the blitz.